Bestselling Caldecott Honor artist David Shannon tells the story of a boy who overcomes a cruel tyrant using his love of baseball. 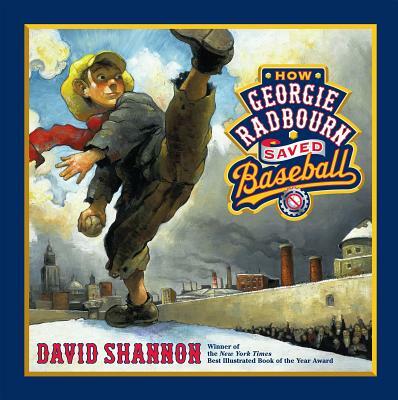 Chosen as a NEW YORK TIMES Best Illustrated Children's Book, HOW GEORGIE RADBOURN SAVED BASEBALL was published more than a decade ago, and it was the very first book award-winner David Shannon wrote and illustrated himself. Using his vast experience as an editorial illustrator, Shannon told an expressive, emotional tale of a time when spring no longer existed, and it was always winter in America. Why? Because an angry dictator declared baseball illegal, and once-happy citizens fell into a dull pace of endless ice, snow, factories, and drudgery. Filled with warmth, drama, and gentle humor, this story presents Shannon's rare ability to create an engaging picture book that can be read on several levels. Perfect for story time, bedtime, and teacher readings, this 2012 edition features a dramatic new cover sure to catch the eye of readers everywhere. Published just in time for baseball season, HOW GEORGIE RADBOURN SAVED BASEBALL is more than a hit--it's a home run!